What effects will global warming have on the Earth’s ice sheets and sea ice? In general, global climate models predict two types of changes in the Earth’s ice sheets. First, warming on land and ocean will cause the melting and thinning of the edges and ice shelves of the Greenland and Antarctic ice caps. This will increase sea level. Second, warming will increase the water vapor content of the atmosphere, leading to more snow over the center portions of the ice caps. This will decease sea level by storing water in new ice. Both of these predictions seem to be coming true. Let’s look first at the Antarctic Ice Sheet. This huge mass holds 91 percent of the Earth’s ice and is the Earth’s largest accumulation of fresh water. 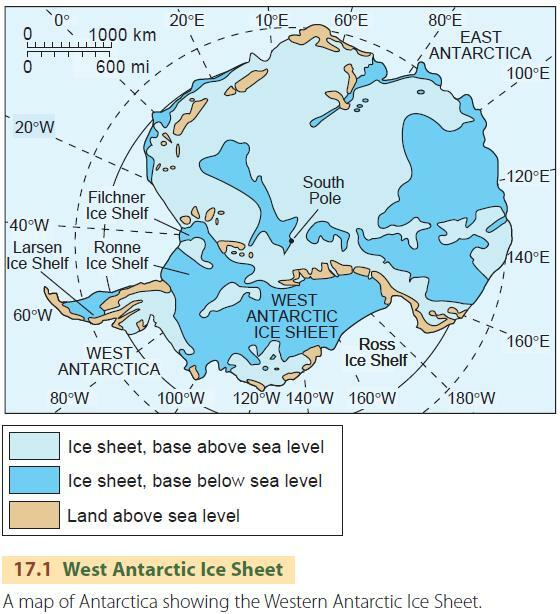 There are two different parts of the Antarctic Ice Sheet, as shown in Figure 17.1—east and west. The East Antarctic Ice Sheet is presently growing, rather than shrinking, as a result of increased snowfall. A recent study funded by NASA and NSF used satellite radar altimeters to measure elevation change from 1992 to 2006, and researchers found that the growth corresponded well with changes in precipitation predicted by global climate models. The amount of growth, however, was quite small, and only slowed sea-level rise by about a tenth of a millimeter per year. For the West Antarctic Ice Sheet, the story is different. This part of the ice cap contains about 10 percent of the total mass of the ice cap, and it is thinning significantly. In fact, the rate of loss of ice mass for the West Antarctic Ice Sheet increased by about 60 percent in 10 years leading up to 2006, according to a study published in 2008 using satellite radar data. Considering all parts of the antarctic ice cap, ice thickness obtained from precise satellite measurements of gravity recently showed that the ice sheet’s mass decreased by about 150 km3/yr (36 mi3/yr)from 2002 to 2005, accounting for about 13 percent of the rise in sea level experienced during that period. The Greenland Ice Cap, too, has been thinning at the edges while growing at the center. Large losses from melting ice along the southeastern coast were slightly exceeded by an increase in ice thickness during the 10-year period ending in 2002. However, that situation may be changing. Since 2002, glaciers flowing into the sea from Greenland have been speeding up. In fact, the rate of glacier flow increased from 63 km3 (15.1 mi3) in 1996 to 162 km3 (38.9 mi3) in 2005, according to recently analyzed satellite radar data. At the other pole, recent attention has focused on the Western Antarctic Ice Sheet. Much of this vast expanse of antarctic ice is “grounded” on a bedrock base that is well below sea level. That is, a large portion of the ice sheet rests directly on deep bedrock without sea water underneath. At present, the grounded ice shelves act to hold back the flow of the main part of the ice sheet. Geophysicists regard this as an unstable situation. A rapid melting or deterioriation of the ice shelves, perhaps in response to global warming, would release the back pressure on the main part of the ice sheet, which would then move forward and thin rapidly. With a reduced thickness, reduced pressure at the bottom of the ice would allow sea water to enter, and soon most of the sheet would be floating in ocean water. The added bulk would then raise sea level by as much as 6 m (about 20 ft). Could this actually happen? New evidence from fossil shoreline deposits suggests that a portion of the antarctic ice sheet collapsed into the ocean as recently as 14,200 years ago. In response, sea level rose about 20 m (65 ft) in a period of about 500 years. This rate is about 20 times larger than the slow rise of sea level measured today and about 4 times larger than the average rate at which sea level rose following the end of the last glacial period. Whether this might occur again is still uncertain. Meanwhile, the climatic warming of the past few decades has caused some ice shelves to thin and fracture more easily. An example is the Larsen B ice sheet which collapsed in 2002 (Figure 17.2). 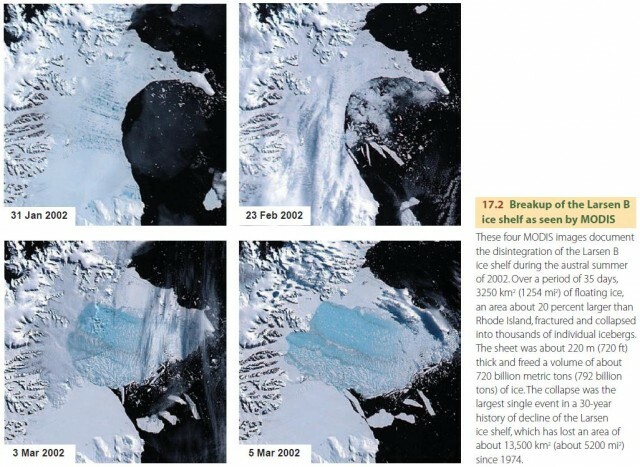 The four MODIS images in Figure 17.2 show the disintegration of the Larsen B ice shelf during the austral summer in 2002. Global warming is also affecting arctic sea ice. The ice pack is shrinking in size and becoming significantly thinner, according to a 2009 NASA study using satellite-borne lasers. Between 2004 and 2008, overall sea ice thickness decreased by 0.17 m/yr (7 in./yr), and the proportion of area covered by thicker, older multiyear ice decreased from 62 percent to 23 percent. Summer ice extent in 2007 was the lowest on record, with 2008 and 2005 showing the second- and third-lowest extent since recording began in 1979. As the ice cover decreases, more solar energy is absorbed by the ocean water that becomes exposed to the Sun, warming the Arctic Ocean further. This effect, coupled with enhanced global warming at high latitudes, has led some scientists to predict that the Arctic Ocean will be ice-free in the summer by 2050.